Cardiovascular disease is a major cause of death in patients with type 2 diabetes mellitus (T2DM) and multiple lipid abnormalities are common. Niacin effectively treats diabetic dyslipidaemia and reduces cardiovascular events in high-risk patients. We evaluated the lipid-altering efficacy and safety (especially, glycaemic control) of extended-release niacin/laropiprant (ERN/LRPT; a tablet containing 1 g ERN and 20 mg LRPT) in patients with T2DM. In this multi-centre, double-blind, placebo-controlled, 36-week study, patients (n=796) were randomised 4:3 to ERN/LRPT or placebo. After four weeks at 1 g/day, ERN/LRPT was doubled to 2 g/day (two tablets) for the remainder of the study. The vast majority of randomised patients (~90%) were dyslipidaemic based on medical history or baseline lipid levels; approximately 80% were taking statins and 99% were on an antihyperglycaemic regimen. At week 12, ERN/LRPT produced significant (p≤0.001 for all) percentage changes from baseline in low-density lipoprotein cholesterol (LDL-C) (–17.9%), high-density lipoprotein cholesterol (HDL-C) (23.2%), LDL-C:HDL-C (–32.0%), triglycerides (–23.1%), apolipoprotein (Apo) B (–17.1%), Apo A-I (8.2%) and total cholesterol (TC):HDL-C (–22.9%) versus placebo. The clinical and laboratory adverse events that occurred more frequently in the ERN/LRPT group versus the placebo group were pruritus, rash, flushing, gastrointestinal upset and elevations in alanine aminotransferase, aspartate aminotransferase, fasting plasma glucose (FPG) and glycosylated haemoglobin (HbA1c). From baseline to week 36, median FPG and HbA1c increased with ERN/LRPT from 7.31 to 7.88 mmol/L and 6.9 to 7.3%, respectively, consistent with known niacin effects. More patients in the ERN/LRPT group required intensified antihyperglycaemic therapy (17.6% vs. 8.2%; p≤0.001). In this population of patients with T2DM, ERN/LRPT produced significant, durable improvements in lipids/lipoproteins and had a safety profile consistent with ERN/LRPT and ERN alone in other populations. An extended version of this paper is available in the downloadable PDFs (see right hand column) to registered users. Registration to the website is free of charge. Treatment with 3-hydroxy-3-methylglutaryl coenzyme A reductase inhibitors (statins) produces significant improvements in plasma LDL-C levels among patients with T2DM.6,7 Patients with T2DM are at high CVD risk and require intensive treatment of multiple lipid parameters. In high-risk patients, lipid treatment goals are frequently not attainable with statin monotherapy, therefore, additional lipid-altering drugs are often required to optimise CVD risk reduction. Niacin (nicotinic acid) raises HDL-C levels, lowers LDL-C, TG and lipoprotein(a) (Lp[a]) levels, and reduces atherogenic small, dense LDL particles.3,8 Niacin, at doses ≥2 g/day, administered alone or in combination with other lipid-modifying therapies, reduces atherosclerotic coronary heart disease (CHD) and may reduce coronary events in patients with CVD.9-13 However, the clinical use of niacin is often hampered by poor tolerability.14,15 Niacin is sometimes associated with gastrointestinal side effects and can increase liver transaminases, uric acid, and fasting plasma glucose (FPG), which at times may necessitate modification of antihyperglycaemic therapy and/or reduction/withdrawal of niacin therapy. & Co., Inc.), designated ERN/LRPT, in dyslipidaemic patients. Due to decreased flushing, ERN/LRPT does not require the multiple-step, incremental up-titration common for ERN. Rather, ERN/LRPT is administered via an abbreviated, two-step dose advancement regimen: 1 g/20 mg for four weeks followed by 2 g/40 mg for maintenance. The present study evaluated the lipid-altering efficacy and safety (specifically, effects on glycaemic control) of ERN/LRPT versus placebo in a patient population with T2DM. Eligible patients included men and women from 18 to 80 years of age with a confirmed diagnosis of T2DM. Patients were required to have LDL-C <2.97 mmol/L and ≥1.55 mmol/L (<115 mg/dL and ≥60 mg/dL) and TG ≤5.65 mmol/L (500 mg/dL) prior to randomisation and be on a stable dose of anti-diabetes mellitus medication (including insulin) for three months prior to visit 1. Patients with type 1 diabetes were excluded from the study. Patients with the following laboratory values at visit 1 were excluded: creatinine >2.0 mg/dL, alanine aminotransferase (ALT) >1.5x upper limit of normal (ULN), aspartate aminotransferase (AST) >1.5x ULN, creatine kinase (CK) >2x ULN, and thyroid stimulating hormone (TSH) >20% above the central laboratory’s normal reference range. Patients with poorly controlled (HbA1c >8.5% at visit 1) or newly diagnosed T2DM (within three months of randomisation) were also excluded. Concomitant drugs that were excluded at study entry included niacin ≥50 mg/day, Cholestin (red yeast rice), concomitant use of fibrate with statin, torcetrapib within one year of visit 1, anti-obesity therapy within three months of randomisation, cyclical hormonal contraceptives or intermittent use of hormone replacement therapies, and systemic corticosteroids. This was a worldwide, multi-centre, double-blind, randomised, placebo-controlled, parallel-group study (protocol number 069; first patient in on 27 July 2007, last patient/last visit on 1 August 2008), with a 36-week double-blind treatment period, preceded by a four-week lipid-modifying run-in period to attain LDL-C <2.97 mmol/L (115 mg/dL), if necessary (figure 1). Detailed information on the patients’ antihyperglycaemic regimen was collected at the randomisation visit. Allowable run-in adjustments included increasing the statin dose, switching to a more effective statin, adding ezetimibe or a bile acid sequestrant. If a patient was receiving a statin, the investigator was prohibited from adding a fibrate to the patient’s regimen. Eligible patients were randomised in a 4:3 ratio to double-blind treatment, starting with ERN/LRPT 1 g (one tablet of ERN 1 g/LRPT 20 mg) or placebo. Randomisation of study drug was achieved via an Interactive Voice Response System. After four weeks of treatment, doses were doubled (two tablets), increasing the ERN/LRPT doses to 2 g/40 mg for the remainder of the study. No adjustments to background lipid-modifying regimens were allowed for the first 12 weeks of the study. After 12 weeks, patients with LDL-C >2.84 mmol/L (110 mg/dL) on consecutive measures could have their non-niacin lipid-modifying regimen adjusted to attain LDL-C <2.84 mmol/L (110 mg/dL). There were eight scheduled clinic visits at weeks –4, –1, 0 (day 1), 4, 8, 12, 24 and 36. The final visit was followed two weeks later by a post-study telephone contact to assess potential serious adverse experiences (AEs). The following laboratory abnormalities were prespecified as values that warranted study discontinuation: consecutive ALT and/or AST elevations ≥3x ULN; consecutive CK elevations ≥5x and <10x ULN with muscle symptoms, consecutive CK elevations ≥10x ULN with or without muscle symptoms, or single CK elevations ≥20x ULN with or without muscle symptoms; consecutive fasting TG >6.77 mmol/L (600 mg/dL); or a positive pregnancy test. Study discontinuation was also pre-specified for patients who experienced hypersensitivity or other severe intolerance to study therapy or who required continuous treatment with systemic corticosteroids. The study protocol was reviewed and approved by the appropriate ethics committees/institutional review boards. All patients provided written informed consent. The study was performed under the guidelines established by the Declaration of Helsinki and Good Clinical Practice standards. The primary end point was efficacy of ERN/LRPT versus placebo on percentage change from baseline in LDL-C levels from baseline to 12 weeks of active treatment. Additional end points included efficacy of ERN/LRPT versus placebo on percentage change from baseline to 12 weeks in HDL-C, TG, LDL-C/HDL-C ratio, non-HDL-C, apolipoprotein (Apo) B, Apo A-I, TC, TC/HDL-C ratio, Lp(a) and C-reactive protein (CRP) after 12 weeks. Subgroup analyses for the percentage change from baseline in LDL-C from baseline to week 12 were performed to explore the consistency of the treatment effect by age (<65, ≥65 years), gender, race (Caucasian, Asian, other), and being at LDL-C goal ≤2.59 mmol/L (100 mg/dL) at baseline (yes, no). Safety was evaluated by reviewing patient-reported AEs, investigators’ observations and assessments, and specific laboratory tests. While blinded to study drug, investigators determined the severity of AEs (mild, moderate, severe or life-threatening) and the potential relationship to treatment (definitely not, probably not, possibly, probably, definitely). Key safety variables were the incidence of any clinical or laboratory AEs, treatment-related AEs, serious AEs, and discontinuations due to AEs. Laboratory evaluations included ALT, AST, CK, FPG, HbA1c and other general surveillance labs (haematology, chemistry, urinalysis, beta-human chorionic gonadotropin). The percentage of patients with worsening of T2DM, defined as experiencing a diabetes-related AE and/or requiring an intensification of anti-diabetes mellitus medication, was assessed. The percentage of patients with a change in antihyperglycaemic medication was also assessed and characterised by investigators as increased, decreased or unchanged in intensity. Several factors (baseline HbA1c, glucose, insulin use, gender and body mass index [BMI]) were evaluated for influencing the intensification of antihyperglycaemic medication in a post hoc analysis using logistic regression. Serious cardiovascular AEs were adjudicated by an independent expert committee. Blinded lipid determinations were performed on fasting plasma samples by a central laboratory (PPD Global Central Laboratories, Highland Heights, KY, USA or Zaventem, Belgium) according to standards specified by the National Heart Lung and Blood Institute and Centers for Disease Control and Prevention.24 LDL-C was calculated using the Friedewald equation.25 In the event of a TG value >4.52 mmol/L (400 mg/dL), LDL-C was measured by preparative ultracentrifugation (15 minutes at 2,000 rpm) and separation using a Fisherbrand® Ulti-Sep™ Serum Separator (Fisher Scientific, Pittsburgh, PA, USA). Plasma cholesterol and TG were determined using enzymatic methods. HDL-C was measured after precipitation of the Apo B-containing lipoproteins (LDL and very low-density lipoprotein [VLDL]) from whole plasma by heparin-manganese chloride. Non-HDL-C levels were calculated by subtracting HDL-C from TC values. Apo B was quantified by immunonephelometry. Glucose was measured in plasma at screening and throughout the study. The efficacy of ERN/LRPT (1 g → 2 g) relative to placebo at week 12 was assessed using a repeated measures analysis. The model used repeated measurements at three study times (weeks 4, 8 and 12) and had fixed effects for treatment-by-time interaction, gender-by-time interaction and baseline-by-time interaction. Similar repeated measures models were used to analyse percentage change from baseline in HDL-C and other lipid parameters (except TG, CRP and Lp[a]) at week 12. For the percentage change from baseline in LDL-C at week 12, a supportive analysis based on an analysis of covariance (ANCOVA) model including terms for treatment, gender and the baseline lipid value as covariate was performed. A similar sensitivity analysis was provided for the percentage change from baseline at week 12 in other lipid parameters. The comparison of treatment groups in TG, CRP and Lp(a) at week 12 was performed using an ANCOVA model applied to Tukey’s normalised ranks of the percentage change from baseline; the model included terms for treatment, gender and Tukey’s normal score of the baseline as a covariate. Safety was assessed by statistical and clinical review of AEs, laboratory values, and vital signs. Inferential comparisons (95% confidence interval [CI] and p values for treatment difference) were provided for the following key safety parameters: hepatitis-related AEs (based on investigator report), ALT and/or AST consecutive elevations ≥3x ULN, CK elevations ≥10x ULN, CK elevations ≥10x ULN with muscle symptoms, CK elevations ≥10x ULN with treatment-related muscle symptoms, confirmed adjudicated cardiovascular AEs and worsening of diabetes, defined as experiencing a diabetes-related AE and/or requiring an intensification of anti-diabetes mellitus medication. Inferential comparisons (95% CI and p values for treatment difference) were also performed for the percentage of patients with a change in antihyperglycaemic medication. For the following AEs, the 95% CI for the treatment difference was provided: overall AEs, overall serious AEs, overall AEs leading to discontinuation, overall treatment-related AEs, AEs by system organ class, and specific AEs that occurred in at least four patients in one or more treatment group. Additional laboratory events of interest included the proportion of patients meeting the predefined limits of change and change from baseline analyses to study end in FPG and HbA1c. Summary statistics over time were calculated for all haematology, blood chemistry and vital sign parameters. Overall, 1,404 patients were screened and 796 patients met the inclusion criteria and were randomised (454 patients in the ERN/LRPT group and 342 patients in the placebo group). In total, 221 patients discontinued prior to completion, and 575 patients completed the study (figure 2). There were no clinically meaningful differences in baseline demographic, anthropometric, or disease characteristics between the treatment groups (table 1). Baseline lipid variables and prior drug therapies were also generally similar across the treatment groups (table 1). The vast majority of randomised patients (~90%) were dyslipidaemic based on medical history or baseline lipid levels; approximately 80% were taking statins and 99% were on an antihyperglycaemic regimen. Significantly (p≤0.001) greater mean percentage reductions in LDL-C were observed from baseline to week 12 with ERN/LRPT versus placebo. The LDL-C treatment effects were generally consistent across pre-specified subgroups defined by patient baseline characteristics, including age, gender, race, and being at LDL-C goal at baseline . Treatment effects were also consistent across baseline HDL-C levels (above or below 40 mg/dL [men] or 50 mg/dL [women]) and baseline TG levels (above or below 150 mg/dL) (data not shown). Significantly greater percentage changes from baseline to week 12 with ERN/LRPT versus placebo were also observed for HDL-C, TG, TC, TC:HDL-C ratio, LDL-C:HDL-C ratio, Apo B, Apo A-I, non-HDL-C, Apo B:Apo A-I ratio, Lp(a) and CRP. The lipid-altering effects of ERN/LRPT were maintained over 36 weeks for the three key lipid parameters (LDL-C, HDL-C and TG; figure 3) and for all other efficacy parameters (data not shown). The HDL-C and TG treatment effects were generally consistent across pre-specified subgroups defined by patient baseline characteristics, including age, gender, race, and baseline levels of LDL-C, HDL-C and TG (data not shown). Treatment-related AEs and discontinuations due to treatment-related AEs were more common in the ERN/LRPT group (table 2). The most common AEs leading to discontinuation in the ERN/LRPT versus placebo groups, respectively, were pruritus (3.6% vs. 0%), flushing (2.0% vs. 0.9%), diarrhoea (1.8% vs. 0.6%), rash (1.8% vs. 0.3%), vomiting (1.1% vs. 0%) and FPG increased (2.2% vs. 0%). There was only one hepatitis-related AE, which occurred in the placebo group. Consecutive ≥3x ULN elevations in ALT and/or AST were seen in three (0.7%) and one (0.3%) patient(s) in the ERN/LRPT and placebo groups, respectively (p=0.6; table 2). All ALT/AST elevations were asymptomatic and resolved with discontinuation of treatment. No subject experienced myopathy or rhabdomyolysis or CK elevations ≥10x ULN (table 2). The incidence of confirmed adjudicated cardiovascular AEs was similarly low in both treatment arms (table 2). Mild increases in FPG and HbA1c were observed in both treatment arms, however, a greater increase was seen in FPG (table 3, figures 4 and 5). The increases in FPG peaked by eight weeks and gradually declined thereafter (figure 4). Slightly greater increases in FPG and HbA1c were observed in the subgroup of patients with an intensification in antihyperglycaemic medication regimen (figures 4 and 5); these subgroup plots should be interpreted with caution because the subgroups were determined by a post-randomisation outcome (intensification in antihyperglycaemic medication regimen). Overall, 3.3% of patients in the ERN/LRPT group discontinued due to a glucose or diabetes-related AE compared with 0.3% in the placebo group (diabetes mellitus: 0.2% vs. 0.3%; hyperglycaemia: 0.7% vs. 0%; blood glucose increased: 2.2% vs. 0%; HbA1c increased: 0.2% vs. 0%, respectively). A higher proportion of patients in the ERN/LRPT group (17.6%) compared with the placebo group (8.2%) had an overall intensification in antihyperglycaemic medication regimen during the nine-month treatment period (odds ratio [95% CI]: 2.38 [1.51, 3.76]; p<0.001). In a univariate analysis, baseline HbA1c, glucose, insulin use and gender were also strong predictors of intensification of antihyperglycaemic medication, regardless of treatment; BMI was not significant. There was no interaction between these predictors and treatment. After applying a stepwise regression on the logistic model, baseline HbA1c (p<0.001), treatment (p<0.001) and gender (p=0.019) remained significant. Finally, the types of medication adjustments were qualitatively similar between the ERN/LRPT and placebo groups, with no meaningful differences regarding the proportion of patients requiring dose increases only (65% and 50%, respectively), addition of a medication only (11% and 18%) or both (24% and 32%). Overall, only two (2.5%) patients in the ERN/LRPT group and one (3.6%) patient in the placebo group required the addition of insulin. Niacin is an important therapy for patients with T2DM because of its broad lipid-modifying effects. Lowering LDL-C levels has been regarded as the primary lipid-modifying intervention in patients, since several clinical trials have shown an associated reduction in the risk of CVD events in high-risk patients, including those with T2DM.26-30 The majority of patients in the present study were on a statin and were at or below LDL-C goal at baseline (mean value =2.23 mmol/L [86.3 mg/dL]); however, an LDL-C threshold below which further reduction yields no additional clinical benefit has not been identified. The Heart Protection Study demonstrated significant and similar CVD risk reductions, irrespective of initial LDL-C level, including patients below LDL-C goal.27 Patients with T2DM remain at high risk for cardiovascular events, despite even intensive LDL-C management to current targets, underscoring the need for addressing additional CVD risk factors. In addition to lipid/lipoprotein parameters, an inflammation process may be important in atherosclerosis and thrombosis. The inflammatory marker, CRP, is a predictor of CHD-related morbidity and mortality, independent of traditional risk factors.40-43 The literature is mixed on the effect of niacin on CRP, with reductions observed in some studies but not others.44-48 In the present study, there was a significant difference in median percentage change in CRP: 0.0% in the ERN/LRPT group versus 14.3% in the placebo group (p=0.004). ERN/LRPT had an AE profile similar to that observed in prior studies with ERN/LRPT.34 AEs that were treatment related or led to discontinuation occurred more frequently in the ERN/LRPT group than in the placebo group. The AEs reported more frequently in the ERN/LRPT group were non-serious side effects, typically associated with niacin or niacin-containing products; specifically, clinical AEs related to flushing, pruritus, rash, and gastrointestinal symptoms and laboratory AEs related to elevations in FPG. The only hepatitis-related AE was in the placebo group. The incidence of consecutive elevations ≥3x ULN in ALT and/or AST, which were all asymptomatic and resolved with treatment cessation, is consistent with results from previous studies.34 No subject had myopathy or rhabdomyolysis and no clinically meaningful increases in CK (≥10x ULN). A pre-specified objective of this study was to assess the proportion of patients requiring intensification of their antihyperglycaemic regimen. For this reason, adjustments in antihyperglycaemic therapy were recorded and investigators were asked to assess whether or not patients experienced an overall net intensification in therapy over the course of the study. In the ERN/LRPT group, 17.6% of patients had an overall intensification in antihyperglycaemic medication regimen versus 8.2% of patients in the placebo group over the nine-month treatment period. A similar trend was observed in the Arterial Disease Multiple Intervention Trial (ADMIT) study, in which 29% of patients with diabetes mellitus taking 1.5 g of Niaspan™ increased dosage or added a new drug to their anti-diabetes mellitus regimen versus 16% of patients taking placebo over 16 weeks of treatment.50 In the present study, more patients treated with ERN/LRPT versus placebo required intensification of antihyperglycaemic medications over nine months. The predictors of antihyperglycaemic medication adjustment, as well as the overall types of adjustments required to manage glycaemic status, were similar in both treatment groups. This study demonstrated that in patients with T2DM, treatment with ERN/LRPT (with or without other stable lipid-modifying therapy) produced superior lipid-altering efficacy at week 12 relative to placebo across the entire lipid profile, including the three major lipid parameters linked with CVD. Additionally, ERN/LRPT in patients with T2DM had a safety profile consistent with ERN/LRPT and with ERN alone in other patient populations.34 This 36-week study suggests that the glucose-elevating effects of ERN/LRPT in patients with T2DM were manageable for the majority of patients. ERN/LRPT may be an important addition to the clinicians’ armamentarium for the management of dyslipidaemia in patients with T2DM, a population with the highest risk for cardiovascular events. This study was funded by Merck & Co., Inc.; ClinicalTrial.gov: NCT00485758. YBM, HG, KV, RAR, KG, CMS and DLM are employees of Merck & Co., Inc. and may hold stock/stock options in the company. JMM, RS, EB and HEB have received consultant/speaker honoraria and/or research grants from Merck & Co., Inc. AM and JP are former employees of Merck & Co., Inc. and may hold stock in the company. 1. American Diabetes Association. Dyslipidemia management in adults with diabetes. Diabetes Care 2004;27(suppl 1):S68–S71. 2. Manzato E, Zambon A, Lapolla A et al. Lipoprotein abnormalities in well-treated type II diabetic patients. Diabetes Care 1993;16:469–75. 3. Expert Panel on Detection, Evaluation, and Treatment of High Blood Cholesterol in Adults (Adult Treatment Panel III). Third report of the National Cholesterol Education Program (NCEP) expert panel on detection, evaluation, and treatment of high blood cholesterol in adults (Adult Treatment Panel III) final report. Circulation 2002;106:3143–421. 4. Grundy SM, Cleeman JI, Merz NB et al. Implications of recent clinical trials for the national cholesterol education program. Adult treatment panel III guidelines. Circulation 2004;110:227–39. 5. Genest J, Frolich J, Fodor G, McPherson R, the Working Group on Hypercholesterolemia and Other Dyslipidemias. Recommendations for the management of dyslipidemia and the prevention of cardiovascular disease: summary of the 2003 update. CMAJ 2003;169:921–4. 6. Lewin A, Kipnes M, Meneghini L et al. ; Simvastatin/Thiazolidinedione Study Group. Effects of simvastatin on the lipid profile and attainment of low-density lipoprotein cholesterol goals when added to thiazolidinedione therapy in patients with type 2 diabetes mellitus: a multicenter, randomized, double-blind, placebo-controlled trial. Clin Ther 2004;26:379–89. 7. Freed MI, Ratner R, Marcovina SM et al. ; Rosiglitazone Study 108 investigators. Effects of rosiglitazone alone and in combination with atorvastatin on the metabolic abnormalities in type 2 diabetes mellitus. Am J Cardiol 2002;90:947–52. 8. Guyton JR, Blazing MA, Hagar J et al. ; for the Niaspan-Gemfibrozil Study Group. Extended-release niacin versus gemfibrozil for the treatment of low levels of high-density lipoprotein cholesterol. Arch Intern Med 2000;160:1177–84. 9. The coronary drug project. JAMA 1972;221:918. 10. Brown BG, Zhao XQ, Chait A et al. Simvastatin and niacin, antioxidant vitamins, or the combination for the prevention of coronary disease. N Engl J Med 2001;345:1583–92. 11. Brown BG, Hillger L, Zhao XQ, Poulin D, Albers JJ. Types of change in coronary stenosis severity and their relative importance in overall progression and regression in coronary disease. Observations from the FATS trial. Familial Atherosclerosis Treatment study. Ann NY Acad Sci 1995;748:407–17. 12. The Coronary Drug Project Research Group. Clofibrate and niacin in coronary heart disease. JAMA 1975;231:360–81. 13. Canner PL, Berge KG, Wenger NK et al. Fifteen year mortality in Coronary Drug Project patients: long-term benefit with niacin. J Am Coll Cardiol 1986;8:1245–55. 14. Capuzzi DM, Morgan JM, Brusco OAJ, Intenzo CM. Niacin dosing: relationship to benefits and adverse effects. Curr Atheroscler Rep 2000;2:64–71. 15. Guyton JR, Bays HE. Safety considerations with niacin therapy. Am J Cardiol 2007;99(suppl):22C–31C. 16. Knopp RH, Ginsberg J, Albers JJ et al. Contrasting effects of unmodified and time-release forms of niacin on lipoproteins in hyperlipidemic subjects: clues to mechanism of action of niacin. Metabolism 1985;34:642–50. 17. Birjmohun RS, Hutten BA, Kastelein JJ, Stroes ES. Increasing HDL cholesterol with extended-release nicotinic acid: from promise to practice. Neth J Med 2004;62:229–34. 18. Illingworth DR, Stein EA, Mitchel YB et al. Comparative effects of lovastatin and niacin in primary hypercholesterolemia: a prospective trial. Arch Intern Med 1994;154:1586–95. 19. Mills E, Prousky J, Raskin G et al. The safety of over-the-counter niacin. A randomized placebo-controlled trial. BMC Clin Pharmacol 2003;3:4–11. 20. Kamal-Bahl SJ, Burke T, Watson DJ, Wentworth CE. Dosage, titration, and gaps in treatment with extended release niacin in clinical practice. Curr Med Res Opin 2008;24:1817–21. 21. Cheng K, Wu TJ, Wu KK et al. Antagonism of the prostaglandin D2 receptor 1 suppresses nicotinic acid-induced vasodilation in mice and humans. Proc Natl Acad Sci U S A 2006;103:6682–7. 22. Sturino CF, O’Neill G, Lachance N et al. Discovery of a potent and selective prostaglandin D(2) receptor antagonist, [(3R)-4-(4-chloro-benzyl)-7-fluoro-5-(methylsulfonyl)-1,2,3,4-tetrahydrocyclopenta[b]indol-3-yl]-acetic acid (MK-0524). J Med Chem 2007;50:794–806. 23. Paolini JF, Mitchel YB, Reyes R et al. Effects of laropiprant on nicotinic acid-induced flushing in dyslipidemic patients. Am J Cardiol 2008;101:625–30. 24. Myers GL, Cooper GR, Winn CL, Smith SJ. The Centers for Disease Control – National Heart, Lung, and Blood Institute Lipid Standardization Program: an approach to accurate and precise lipid measurements. Clin Laboratory Med 1989;9:105–35. 25. Fridewald WT, Levy RI, Fredrickson DS. Estimation of the concentration of low-density lipoprotein cholesterol in plasma, without use of the preparative ultracentrifuge. Clin Chem 1972;18:499–502. 26. Haffner SM, Alexander CM, Cook TJ et al. ; for the Scandinavian Simvastatin Survival Study Group. Reduced coronary events in simvastatin-treated patients with coronary heart disease and diabetes or impaired fasting glucose levels. Arch Intern Med 1999;159:2661–7. 27. Heart Protection Study Collaborative Group. MRC/BHF Heart Protection Study of cholesterol lowering with simvastatin in 5963 people with diabetes: a randomized placebo-controlled trial. Lancet 2003;361:2005–16. 28. Colhoun HM, Betteridge DJ, Durrington PN et al. ; on behalf of the CARDS investigators. Primary prevention of cardiovascular disease with atorvastatin in type 2 diabetes in the Collaborative Atorvastatin Diabetes Study (CARDS): multicentre randomized placebo-controlled trial. Lancet 2004;364:685–96. 29. Sever PS, Dahlöf B, Poulter NR et al. ; ASCOT investigators. Prevention of coronary and stroke events with atorvastatin in hypertensive patients who have average or lower-than-average cholesterol concentrations, in the Anglo-Scandinavian Cardiac Outcomes Trial–Lipid Lowering Arm (ASCOT-LLA): a multicentre randomized controlled trial. Lancet 2003;361:1149–58. 30. Cannon CP, Braunwald E, McCabe CH et al. ; Pravastatin or Atorvastatin Evaluation and Infection Therapy-Thrombolysis in Myocardial Infarction 22 Investigators. Intensive versus moderate lipid lowering with statins after acute coronary syndromes. N Engl J Med 2004;350:1495–504. 31. Miller NE, Thelle DS, Førde OH, Mjøs OD. The Tromsø Heart Study. High-density lipoprotein and coronary heart disease: a prospective case-control study. Lancet 1977;1:965–8. 32. Stampfer MJ, Sacks FM, Salvini S, Willett WC, Hennekens CH. A prospective study of cholesterol, apolipoproteins and the risk of myocardial infarction. N Engl J Med 1991;325:373–81. 33. Barter P, Gotto A, LaRosa J et al. ; on behalf of the TNT Steering Committee and Investigators. On-treatment levels of HDL-C and the ratio of LDL-C/HDL-C as predictors of cardiovascular events in the treating to new targets (TNT) study. J Am Coll Cardiol 2006;47:298A. 34. Maccubbin D, Bays HE, Olsson AG et al. 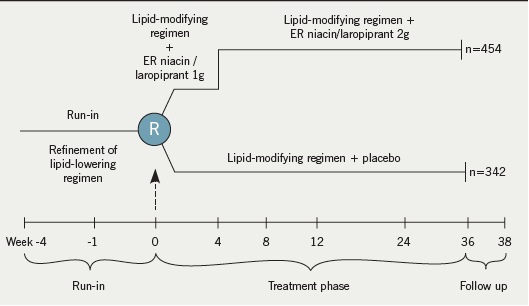 Lipid-modifying efficacy and tolerability of extended-release niacin/laropiprant in patients with primary hypercholesterolaemia or mixed dyslipidaemia. Int J Clin Pract 2008;62:1959–70. 35. Zhao X-Q, Yuan C, Hatsukami TS et al. Effects of prolonged intensive lipid-lowering therapy on the characteristics of carotid atherosclerotic plaques in vivo by MRI: a case-control study. Arterioscler Thromb Vasc Biol 2001;21:1623–9. 36. Canner PL, Furberg CD, McGovern ME. Niacin decreases myocardial infarction and total mortality in patients with impaired fasting glucose or glucose intolerance: results from the Coronary Drug Project [Abstract 3138]. Circulation 2002;106(suppl II):636. 37. Morse JS, Brown BG, Zhao X-Q et al. Niacin plus simvastatin protect against atherosclerosis progression and clinical events in CAD patients with low HDL-C and diabetes mellitus or impaired fasting glucose [Abstract 842-3]. J Am Coll Cardiol 2001;37(suppl A):262A. 38. Frost PH, Havel RJ. Rationale for use of non-high-density lipoprotein cholesterol rather than low-density lipoprotein cholesterol as a tool for lipoprotein cholesterol screening and assessment of risk and therapy. Am J Cardiol 1998;81:26B–31B. 39. Lamarche B, Moorjani S, Lupien PJ et al. Apolipoprotein A-I and B levels and the risk of ischemic heart disease during a five-year follow-up of men in the Quebec cardiovascular study. Circulation 1996;94:273–8. 40. Ridker PM, Hennekens CH, Buring JE, Rifai N. C-reactive protein and other markers of inflammation in the prediction of cardiovascular disease in women. N Engl J Med 2000;342:836–43. 41. Ridker PM, Rifai N, Rose L, Buring JE, Cook NR. Comparison of C-reactive protein and low-density lipoprotein cholesterol levels in the prediction of first cardiovascular events. N Engl J Med 2002;347:1557–65. 42. Haverkate F, Thompson SG, Pyke SD, Gallimore JR, Pepys MB. Production of C-reactive protein and risk of coronary events in stable and unstable angina European Concerted Action on Thrombosis and Disabilities Angina Pectoris Study Group. Lancet 1997;349:426–62. 43. Pietila KO, Harmoinen AP, Jokinitty J, Pasternack AI. Serum C-reactive protein concentration in acute myocardial infarction and its relationship to mortality during 24 months of follow-up in patients under thrombolytic treatment. Eur Heart J 1996;17:1345–9. 44. Grundy SM, Lenza Vega G, McGovern ME et al. ; Diabetes Multicenter Research Group. Efficacy, safety and tolerability of once-daily niacin for the treatment of dyslipidemia associated with type 2 diabetes. Arch Intern Med 2002;162:1568–76. 45. Kuvin JT, Dave DM, Sliney KA et al. Effects of extended-release niacin on lipoprotein particle size, distribution, and inflammatory markers in patients with coronary artery disease. Am J Cardiol 2006;98:743–5. 46. Thoenes M, Oguchi A, Nagamia S et al. The effects of extended-release niacin on carotid intimal media thickness, endothelial function and inflammatory markers in patients with the metabolic syndrome. Int J Clin Pract 2007;61:1942–8. 47. Taylor AJ, Sullenberger LE, Lee HJ, Lee JK, Grace KA. Arterial biology for the investigation of the treatment effects of reducing cholesterol (ARBITER 2). A double blind, placebo-controlled study of extended-release niacin on atherosclerosis progression in secondary prevention patients treated with statins. Circulation 2004;110:3512–17. 48. Taylor AJ, Sullenberger LE, Lee HJ. The effect of 24 months of combination statin and extended-release niacin on carotid intima–media thickness: ARBITER 3. Curr Med Res Opin 2006;22:2243–50. 49. Garg A, Grundy SM. Nicotinic acid as therapy for dyslipidemia in non-insulin-dependent diabetes mellitus. JAMA 1990;264:723–6. 50. Elam MB, Hunninghake DB, Davis K et al. Niacin favorably affects plasma lipid and lipoprotein levels with minimal effects on glycemic control in diabetic subjects. JAMA 2000;284:1263–70. 51. Skyler JS, Bergenstal R, Bonow RO et al. ; American Diabetes Association; American College of Cardiology Foundation; American Heart Association. Intensive glycemic control and the prevention of cardiovascular events: implications of the ACCORD, ADVANCE, and VA diabetes trials. Circulation 2009;119:351–7.